It is likely that Elijah would have never been born had I not soaked in over many years the vision, openness, creativity and religious authenticity of Rabbi David Hartman. David was one of my teachers at Hebrew University, during my undergraduate years, but his lasting influence on me was the result of having spent over a decade at the institute of advanced studies of the Shalom Hartman Institute, that he founded and breathed life into. 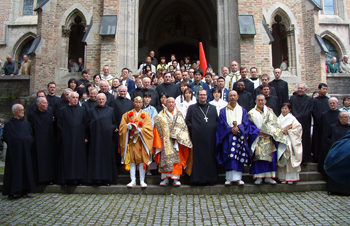 What made the Institute unique was that we were allowed to be complete, whole, religious personalities, integrating our studies with our religious life. For so many of us, a dry and religiously alienating ethos governed the university setting, and the Institute provided a haven for those who thought to think through religious issues with commitment and creativity. David was only an enabler; he was a model. He was a model for someone struggling to work through the issues of faith in a contemporary social and academic setting. But for me personally, he was a lot more than that. My own work in interfaith is directly indebted to all that I learned from David. Having founded a center for interreligious dialogue within the Institute, leading scholars from Harvard, Chicago and GTU were regular members of our annual theological conference. This was the first time I had engaged scholars and thinkers of other religions in a systematic, continuing manner. The patterns of conversation and study, the quality of discourse and the lasting impact of friendship informed my own work at Elijah. Having had the privilege of moderating the interreligous forum over a number of years, The Hartman Institute provided me with the kind of hands on training that proved to be the foundation for establishing the Elijah Institute. David was a model not only in terms of setting intellectual precedents. He taught me that visions need to be embodied, and that long lasting effect requires the construction of appropriate vehicles. Thus, probably more than any other Institute, the Hartman Institute has continued to provide for me a model of how to construct an Institute, and in particular – how to not let one’s vision be frustrated by the vicissitudes of organizational life. When Elijah was founded, Hartman invited me to locate the entire enterprise within his institute. I had to turn down his generous offer. I felt that a truly interreligious project could not be housed in an organization associated with one particular religion. This is why we sought and obtained UNESCO sponsorship, suggesting no religion has priority. But even if Elijah never had a formal relationship with the Hartman Institute, David Hartman and the Shalom Hartman Institute will always be remembered as the home where I grew and developed, until such time that I could fly from the safe haven and nest provided by David and realize my own particular calling, through the Elijah Interfaith Institute. Stanley was, as he was recently eulogized, a prince of a man. He had a wide and open heart, an understanding for human beings, and the capacity to transform great ideas into institutional frameworks that outlast their founder. He was an institution builder, who built in Denver a synagogue, a department of Judaic studies and a museum. Stanley joined the administrative board of Elijah in the late 90s and provided the vision for much that has become representative of Elijah. Following the intifada, in 2000, it became impossible to conduct courses for seminarians in Jerusalem, and I sought to create, instead, an interreligious think tank. Stanley insisted that it was not sufficient to create a think tank, or an Academy, as we called it, no matter how good it is. If such an institution is to come into being, it must be owned by the world’s religious leaders, and not simply by Alon and his friends. This led to the formation of the Elijah Board of World Religious Leaders, a community of high level leaders that continues to meet, engage, respond and share for the past decade. Some close friends were skeptical as to the likelihood of drawing leaders to our vision. Stanley was visionary enough to recognize the potential of the idea which has shaped Elijah since. Stanley then took the institutional vision a step further. The work of scholars and leaders must be taken to the community. Stanley not only saw this as a possibility, but set out to create a US wide network that would take Elijah’s study resources to the community. This may have been the one project he did not succeed in realizing. Despite serious efforts, a variety of factors conspired to prevent the realization of this vision. Some aspect of this vision have become integrated in Elijah’s continuing work, but the idea of coordinated study of high end interfaith materials, taking place simultaneously across the US and beyond never became a reality. 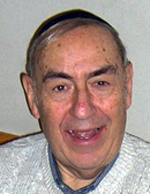 A man of heart, vision and practicality, Rabbi Stanley Wagner is someone who not only believed in Elijah but invested time and attention in advancing its cause over many years. I will always remain grateful to him for that. The Elijah Interfaith Institute marked UN World Interfaith Harmony Week by messages and prayers of Hope conducted by religious leaders in our many sites around the globe. Individual communities and gatherings of people from multiple faiths put our trust in the power of prayer to transform and to heal. By expressing a vision of Hope, we reiterated the importance of religion in providing a positive message, countering the possibility that the encounter with the daily travails of life will lead to despair. The booklet and video prepared by members of the Elijah Board of World Religious Leaders was used as a source of inspiration and content, providing the unity between events that took place in Asia, Africa and Europe. Taiwan, Chinese New Year Eve, February 9th. 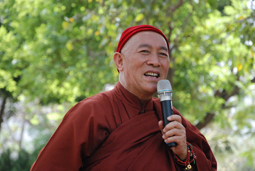 Dharma Master Tao, Buddhist member of the Elijah Board of World Religious Leaders, transformed the official ceremony to welcome the Chinese New Year into a gathering for Hope. He read an excerpt from the Message of Hope in the Elijah booklet to the gathering of government officials as part of his blessings of well-being for all. Here you can hear Dharma Master Tao’s message (in Chinese) and here’s a script with Dharma Master Tao’s Message of Hope (Chinese with translation). Geneva- Centre Vedantique, Saturday, the 9th February. Nicco Park, Kolkata, West Bengal, India, 8, 9 and 10 February. An event was held featuring music and prayers of hope to promote world harmony and peace. 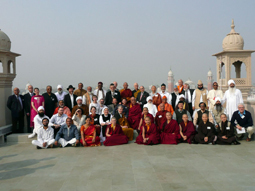 This was an initiative of the Kolkata-based Youth Movement called Prantakatha, (www.prantakathaindia.org) under the guidance of Swami Atmapriyananda, Vice Chancellor, Ramakrishna Mission Vivekananda University and a Co-Chair of the Steering Committee of World Religious Leaders of the Elijah Interfaith Institute. Read more about this musical initiative. Munich, Germany – St. Ottilien, 1st February – 18th of March. The Booklet of Hope was placed in the reading room of the monastery and all member of the congregation and visitors were encouraged to read it. On 10th February, the Christian worshipers were invited to join their prayers of hope with those in other parts of the world. The culmination of the effort will take place on 18th March, when Christians and Jews will pray together under the leadership of Josef Thomas Goetz, representing Primate Notker Wolf on the Elijah Board of World Religious Leaders. Gambhira Ashram, Kumbha Mela, Allahabad, India, 10th February. A whole day event was dedicated to Prayers of Hope. Religious traditions involved were Hindu, Jain, Christian, Muslim, Jewish, Sikh, Buddhist, and people of tribal religions. 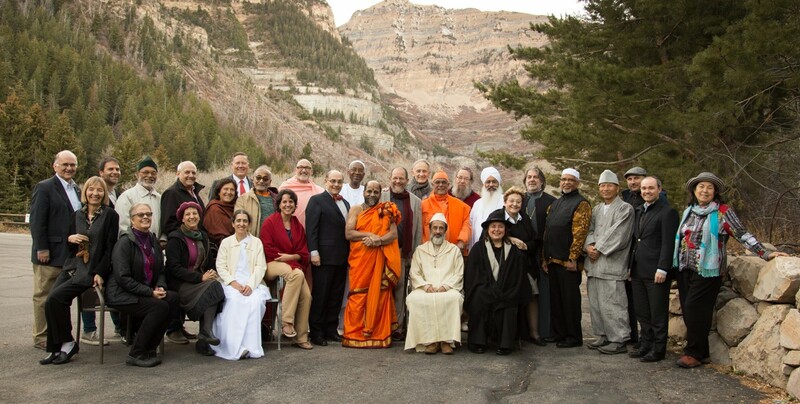 The event was organized by Shrivatsa Goswami, a Hindu member of the Elijah Board of World Religious Leaders. 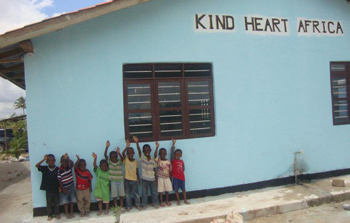 Tanzania, Kind Heart Africa Orphanage Center, Dar Es Salaam, 10th February. Buddhist leader, Ven. Prof. Jinwol Sunim of Korea led followers of the Buddhist, Christian, Muslim and Indio religions in a ‘Prayers of Hope event. Buddhist leader, Bhikkhu Sanghasena, led his community in special prayers and meditation dedicated to interfaith harmony and hope, inspired by the Elijah project, and to UN World Interfaith Harmony Week. This was despite the severe cold of the mid winter, which meant that gathering an interfaith group was not feasible. Jerusalem – Jaffa Gate, Friday 8th February. Christian, Muslim, Jewish Prayers of Hope. 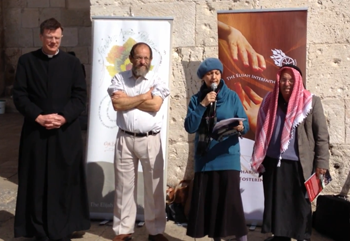 Prayers were read by Rabbi Dr Alon Goshen Gottstein, Director of the Elijah Interfaith Institute, Fr Eamon Kelly of Notre Dame and Haj Ibrahim of the Mount of Olives. Many other communities included messages of hope in their regular gatherings, drawing attention to UN World Interfaith Harmony Week, including the Brahma Kumaris in Oxford in the UK, the hosts of last year’s meeting of the Elijah Board of World Religious Leaders. For those of you who might be in Krakow on May 19-21, please consider registering for our Bibliodrama Interfaith conference, part of the Grundtvig (European Union) project, BASICS, in which Elijah is a partner. For more details click on Bibliodrama Interfaith Conference Information. “The radical particularization of history eliminates the need for faith communities to regard one another as rivals. Competition between faith traditions arises when universality is ascribed to particular historical revelations. When revelation is understood as the concretization of the universal, then ‘whose truth is the truth?’ becomes the paramount religious question, and pluralism becomes a vacuous religious ideal. If, however, revelation can be separated from the chain of universality, and if a community of faith can regain an appreciation of the particularity of the divine-human encounter, then pluralism can become a meaningful part of biblical faith experiences.” (A Heart of Many Rooms, 165).